In line with the government’s objectives to make Turkey a regional hub for natural gas trading, a natural gas spot market has been established by the Natural Gas Organized Wholesale Market Regulation published in the Official Gazette on 31 March 2017. • balancing the supply and demand in the natural gas transmission system. According to the Regulation, the spot market will become operational on 1 April 2018. Until such date, a “virtual implementation” will be conducted without any delivery, invocing or payment obligation. Within 30 days from the publication of the Regulation, EPİAŞ will prepare the Market Operation Principles and Procedures, and submit to the Energy Market Regulatory Authority (“EMRA”) for its approval. 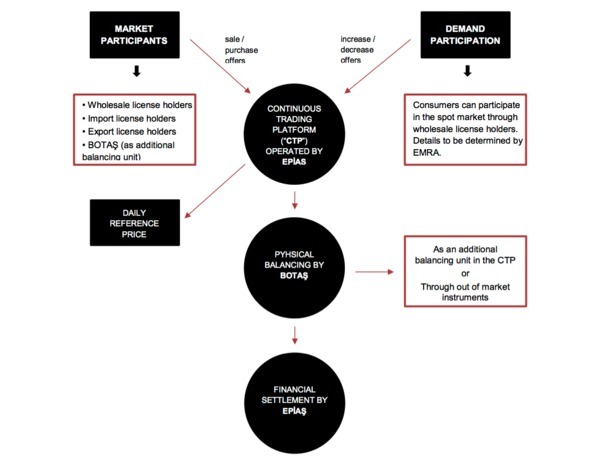 EMRA will also issue the principles for participation of the consumers to the spot market. The establishment of a natural as spot market was a long-awaited initiative in Turkey. After lengthy preparatory works, a draft version of the Regulation was published on the website of EMRA in October 2016 to receive the comments and opnions of the public. The spot market, once it becomes operational on 1 April 2018, is expected to provide a competitive market for the private players by providing reliable price signals, and to increase the demand-supply balance in the natural gas transmission system.